Intelligent identify the optimal current for charging. Charge faster, save time. Auto detect technology, identify your device and charge them at the max speed. 2.High pressure intemal, Please don`t open it yourself. 3.Don`t use after infiltrate the water or throw into the fire. 4.Pay attention to moisture proof and waterproof. 【2 IN 1 CHARGING STATION】The multi charger station with wireless charger & 8 smart USB ports can charge up to 8 of your devices simultaneously at full speed. 【ISMART CHARGING TECHNOLOGY】Every USB port charges faster and more efficient with Smart Charging Technology. 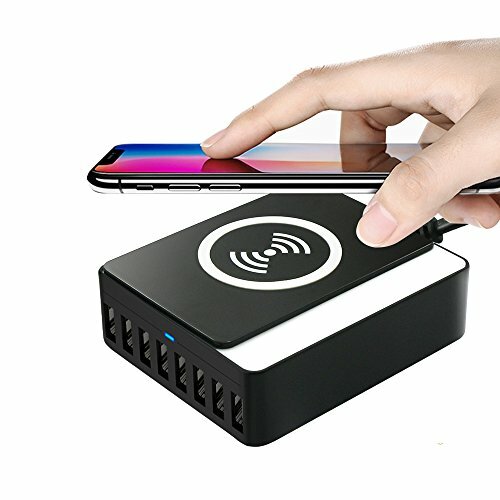 It will automatically identifies connected devices and their unique charging requirements to deliver its fastest possible lightning charge speed up to 2.4 amps per port or 12 amps overall. 【WIDELY COMPATIBILITY】This charger is compatible with iPhone X, 8/7/6/5S, iPad Pro/Air, Samsung Galaxy S8 Edge/S6/S5/S4/S3/, iPod, Motorola, and other Wireless or USB Devices. 【COMPACT USB WIRELESS CHARGER】4.9ft power cable is long enough to let the charger reach further. Small and compact shape for added portability. Perfect charging station for use in the hotel or conference room, guest room. 【MULTIPLE PROTECTIONS & GUARANTEED SAFETY】Made of Fire-resistant and hardened plastic outer shell, high temperature resistance, multi protection system from overheating & Power Control & Voltage Stabilizer, which will protect you safe. 12-Month Warranty.